As I prepared to hop on a plane to Nicaragua, a place I've never visited and have only cursory knowledge of, and Uncle Sam had me on edge. "In the past, there have been instances of U.S. citizens targeted by criminals posing as Nicaraguan police officers who pull over their vehicles - including those operated by reputable hotels - for inspection," a U.S. State Department advisory warns matter-of-factly. "In each case, the incidents happened after dark and involved gun-wielding assailants who robbed passengers of all valuables and abandoned them in remote locations." That I'm planning to make a three-hour drive along the country's notoriously rough roads in a rented truck with the vaguest sense of direction and a few hours to spare before nightfall doesn't help. Nor does the no-nonsense U.S. Navy captain I ran into at the Hertz car rental office in Managua after my four-hour flight from Houston. "I've driven in Baghdad," he said ominously. "Being on the road in Nicaragua is even worse - it's crazy out there." I thought about Ronald Reagan as I pulled onto a smoggy roadway packed with zigzagging motorcycles and lumbering big rigs several minutes later. If the late president taught us anything, it's that overconfident junkets into the Nicaraguan jungle rarely are without folly. Within an hour, I was lost and glancing nervously at the gas gauge on my pug-nosed Mahindra truck (an Indian export) as I pulled into a dusty village of slouching fruit stands and decaying squatters' camps. When I approached a police officer leaning under the shade of a palm tree, he glanced at me with a look that said, "Where the hell did you come from?" It's better than, "How much money do you have in your wallet?" Another Nicaraguan police officer posited that question during a traffic stop several days later, before graciously relieving me of its burdensome contents. That would be my first request for directions from a total stranger in Nicaragua, but far from my last. Everyone obliged, despite my limited Spanish vocabulary and poorly conceived gesticulations. 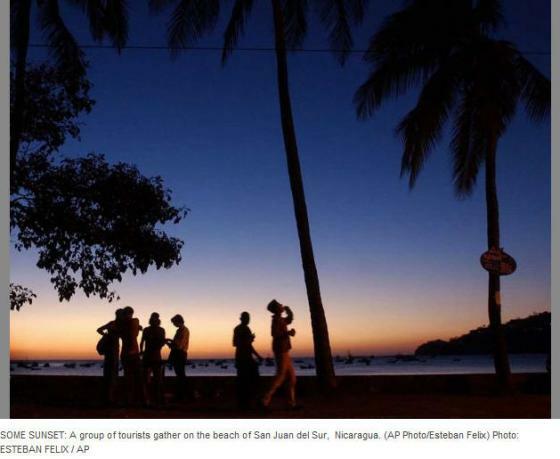 Several hours later, I arrived in San Juan del Sur, a tranquil tourist hangout of fluorescent-colored shops and airy cafes huddled around a sandy bay on the southwestern Pacific coast. Somewhere along the way, I learned to decipher Nicaraguans' preferred method of nonverbal communication: hand-drawn maps generously scribbled onto anything and everything - scraps of paper, pieces of trash, even human skin. Though San Juan del Sur is perfectly quaint, it also was a little slow for my purposes. I was more interested in exploring the surrounding area. So the next day, I traded my truck for a bright-red ATV from a rental shop downtown. Following my guide, Luis, I couldn't stop myself from pushing the four-wheeler's speed as we zipped through the Nicaraguan countryside past village baseball games, brightly colored farmhouses tucked into palm groves and scenes of stirring pastoral beauty. Several hours later, Luis and I were dust-caked, sweaty and bouncing down a steep back-country road past stray goats and cows when the first hint of sparkling turquoise water appears through a tangle of Nicaraguan jungle. Angling around a final bend, I found myself face to face with a beach lover's dream: A mile long stretch of pristine white sand and crashing green waves enclosed by outcroppings of craggy rock, all of it shimmering in the baking tropical sun. This is Playa Madera, a remote surfing hamlet within eyesight of the Costa Rican border. Taking off my helmet, I plopped in the hot sand to take in the curling waves with a cold Tona Cerveza (a Nicaraguan staple) when I realized getting here was the easy part. Forcing myself to leave this paradise - with its unwashed collection of dreadlocked surfers, wandering dropouts and laid-back locals - would be a far more difficult undertaking. A couple of beat-up SUVs were parked outside a scruffy bar that looks like it was constructed of driftwood. Surfers sipped beer and ate fish tacos as the bar's speakers unleash a steady stream of thumping reggae. Nearby, a rundown hostel sold smoothies and cheap rooms no bigger than a coffin for about $8 a night. I came to Nicaragua for discoveries like this, the kind that are luring jaded travelers from well-trodden destinations such as Costa Rica, where the cost of spending a few days along the country's beaches has climbed as high as the luxury condominiums that tower over them. If the country remains unheralded, it's partly because of reputation. To be sure, the country's days as a narco-friendly hotbed of civil war, human rights abuses and clandestine spy games are long gone. But in many ways, Nicaragua's rough-hewn edges - the kind that pop up in State Department travel advisories but allow for enduring cheapness and accessibility - are not. 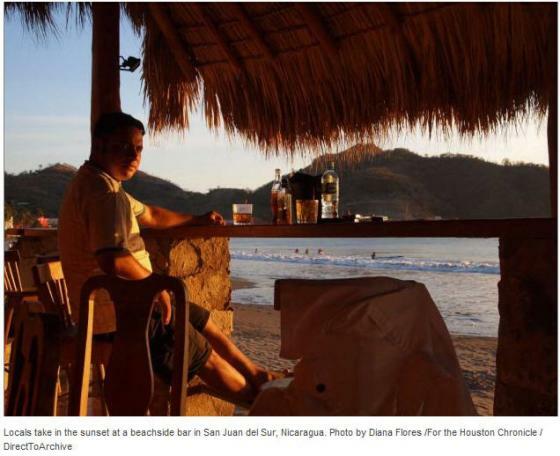 Despite a growing number of American expats arriving daily from the shores of other Central American hot spots, Nicaraguan tourism is "still in diapers," as one local business owner told me. I spent the next few nights at the Buena Vista Surf Club, a tiny resort of thatched-roof huts on a hill overlooking Playa Madera. The resort is owned by a friendly Dutch couple and their two dogs. Each night, in the main lodge, they treat their guests - a hodgepodge of mostly Europeans and Americans - to a communal dinner in which quirky travel stories are swapped and fleeting friendships are quickly made. Afterward, the club's sprawling wooden deck becomes the perfect setting for gazing at the stars and chatting late into the night with a glass of cheap rum as thoughts of the world back home disappear in the ocean breeze. My room was simple yet elegant, its windows sliding open to reveal a canopy of leafy branches that comes alive after dark, at times terrifyingly so. One morning, it still was dark outside when I was jolted awake by the deep-throated and murderous bellow of a male howler monkey drooping from a nearby branch. Despite his diminutive size, he expelled a distorted roar that can only be described as demonic, rendering the guttural groans of "Captain Howdy" (the supernatural force from The Exorcist movie) timid by comparison. Going back to sleep was no longer an option after such an encounter. So, I decided to do the next-best thing - go surfing. The sun cast a soft glow on the early-morning sky as I paddled out beyond the first few sets of steely-blue waves, before turning to look at the empty beach stretched out before me. That's when it hit me - the strange familiarity of this place. It's not that I'd been here before; I hadn't. But during those long middle-of-winter days, when I languished pasty-skinned and light-deprived in an office cubicle nursing fantasies of escape, I imagined exactly this - I'm convinced everyone has. As I packed my bags for home a few hours later, I realized Uncle Sam was right: Nicaragua is indeed unvarnished and a bit unpredictable.